Hope your week is going well – I know its only Tuesday but you have to be positive right?? We have had a wonderful summer – hot and not too rainy. My tomatoes and vegetable garden having been loving it! 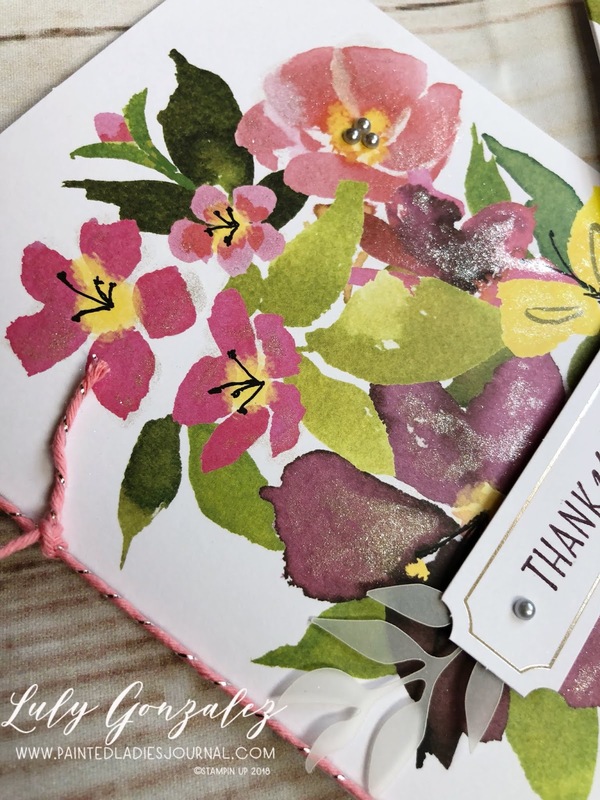 I have an easy card today – its from this month’s Paper Pumpkin called Blooming Love. It is a gorgeous kit with watercolored flowers and heartfelt sentiments. I have been a Paper Pumpkin subscriber for almost a year now (well before I became a demonstrator) and its one of my favorite Stampin Up products. This month we were given enough supplies to make 10 cards , labels, stamp set, flirty flamingo & silver twine with silver edge envelopes – so elegant! I followed the directions (for the most part) but I always make some small adjustments along the way. Espero que su semana va bien-sé que su único martes, pero usted tiene que ser positivo, ¿verdad? Hemos tenido un verano maravilloso – caliente y no demasiado lluvioso. Mis tomates y vegetales lo estan amando! Tengo una tarjeta fácil hoy-es de este mes de Paper Pumpkin llamado Blissful Blooms. Es un kit magnífico con las flores acuareladas y los sentimientos sinceros. He sido un suscriptor de Paper Pumpkin por casi un año ahora (mucho antes de que me convertí en un demostrador) y es uno de mis productos favoritos de estampación. Este mes nos dieron suficientes provisiones para hacer 10 tarjetas, etiquetas, Set de sellos, coqueta flamenco & cinta de plata con sobres de plata bordado-tan elegante! Seguí las indicaciones (en su mayor parte) pero siempre hago algunos pequeños ajustes en el camino. All I had to do was stamp the two sentiments on the silver tags, add the vellum flowers directly to the back of the tag, add the twine and pop up the tag on stampin dimensionals which are included in the kit. In fact, everything you need to use is included in the kit – including a stamping block in your first month, a different color ink spot every month and all the adhesive and dimensionals you need for the project. 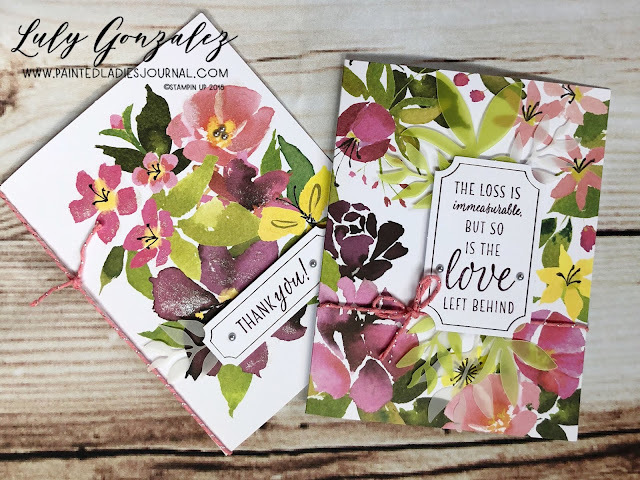 There are some very versatile sentiments in this kit – including a very nice sympathy sentiment. Todo lo que tenía que hacer era estampar los dos sentimientos en las etiquetas de plata, añadir las flores de vellum directamente a la parte posterior de la etiqueta, añadir la cinta y pop-up la etiqueta en los stampin dimensionales que se incluyen en el kit. De hecho, todo lo que necesitas para hacer la tarjeta está incluido en el kit – incluyendo un bloque de estampado en tu primer mes, un spot de tinta de color diferente cada mes y todos los adhesivos y dimensionales que necesitas para el proyecto. Hay algunos sentimientos muy versátiles en este kit – incluyendo un sentimiento de simpatía muy agradable. I will be back with some alternate projects in the next few days but I wanted to tell you about a special offer for next month’s Paper Pumpkin for all you Halloween lovers! If you sign up for September’s kit by September 10th, the projects will be Halloween themed and look at the awesome box…. Every month it is a surprise for everyone but we do know that there are 24 different treat packages – great for a class room gift for your kids (or co-workers!). If you are interested – sign up now because they can sell out! And there is no obligation to subscribe – so give it a try this month! Voy a estar de vuelta con algunos proyectos alternativos en los próximos días, pero quería contarles acerca de una oferta especial para el próximo mes de Paper Pumpkin para todos los amantes de Halloween! Si te apuntas para el kit de septiembre antes del 10 de septiembre, los proyectos serán temáticas de Halloween y mira la caja tan impresionante.... Cada mes es una sorpresa para todos, pero sabemos que completa 24 paquetiticos – ideal para un regalo de la aula de clase o compañeros de trabajo!. Si estás interesado – Regístrate ahora porque pueden agotar! Y no hay obligación de suscribirse – ¡ así que pruébalo este mes! As always if you have any questions about this project or any papercrafting, feel free to email me. Until next time! Como siempre si usted tiene alguna pregunta sobre este proyecto o cualquier papercrafting, no dude en enviarme un correo electrónico. ¡ hasta la próxima!